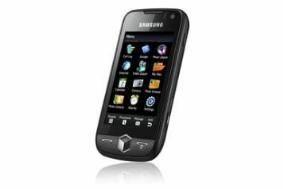 Samsung Jet smartphone aims to shoot down Apple's iPhone | What Hi-Fi? The Samsung Jet uses a 3.1in wide Active Organic Light Emitting Diode (AMOLED) screen, which Samsung claims allows for colours so bright that they're 'better than life-like'. Off-axis viewing is said to be improved, too, while they're also less power hungry than TFT LCD rivals, and the resolution is four times higher than the WQVGA. Doing the donkey work is an 800MHz processor. This should allow for fast response times and high-speed access to all the various functions. Again, it should also help extend the battery life. Navigating the machine is done using a 3D touch, TouchWiz 2.0 interface, and there's a one-touch zoom function on board the handset, too. Widgets are all the rage in the TV world at the market and the Samsung Jet joins in the fun with downloadable widgets giving you access to various applications focusing for now on the usual selection of news, weather and finance. Other features include a 5 megapixel camera, built-in GPS, DNSe & SRS Sound Effect technology, and DivX and XviD video support for downloading and viewing. We've no information on release date or pricing for the Samsung Jet as yet.